This year's best of bees is somewhat topical as I'm writing a book relating to the topic. 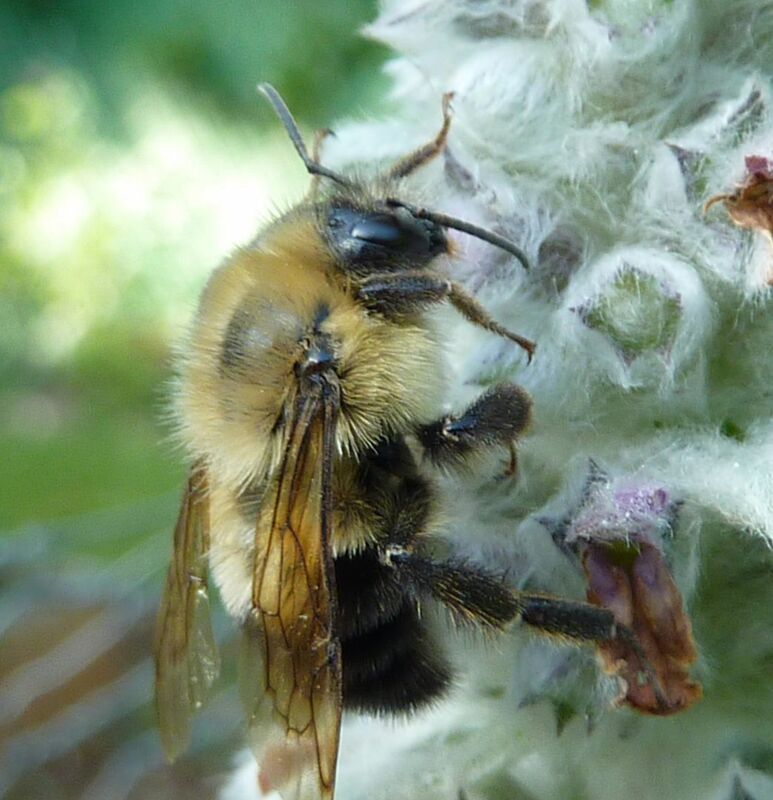 It's about honeybees which are nonnative, but by planting native plants as the nectar and pollen plants I believe that the conservation of native bees will come naturally. Even if you're not putting out mason bee nest boxes, or bumblebee homes (which don't work as often as I'd like them to), the fact that we're increasing pollen and nectar sources will benefit things that eat pollen and nectar. So there's this sort of idea that conservation will come naturally, especially when we're talking about flying insects. The thing about honeybees is they go for abundant sources of pollen and nectar and communicate where the food is by means of a waggle dance. So a maple tree that's 60' tall is likely going to win out to an apple tree that's only 15' tall. There is more to forage on the maple tree and more bees are waggle dancing about it too. 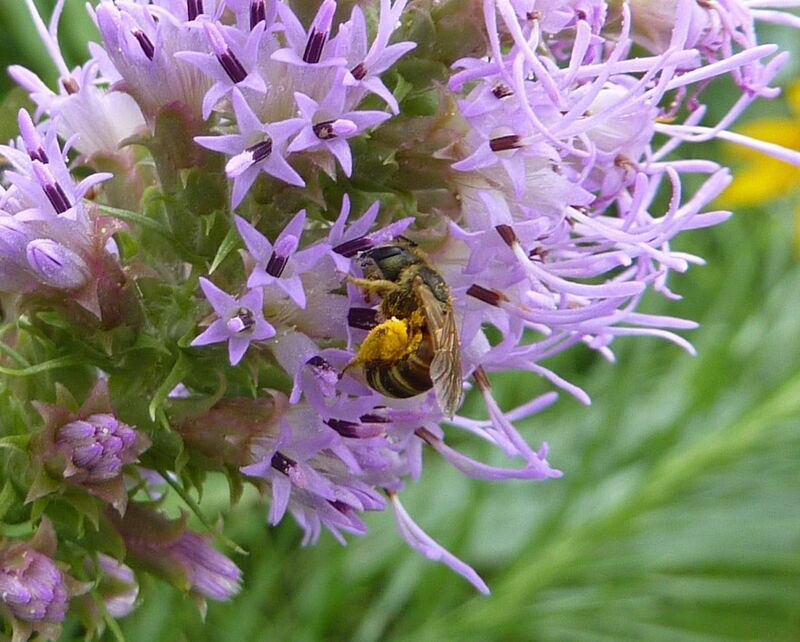 Bees are loyal to one particular plant species when they go foraging, and rarely change plants mid foraging trip. This is why you never see honeybees... bees in general with multicolored baskets of pollen on their legs or under the abdomen. 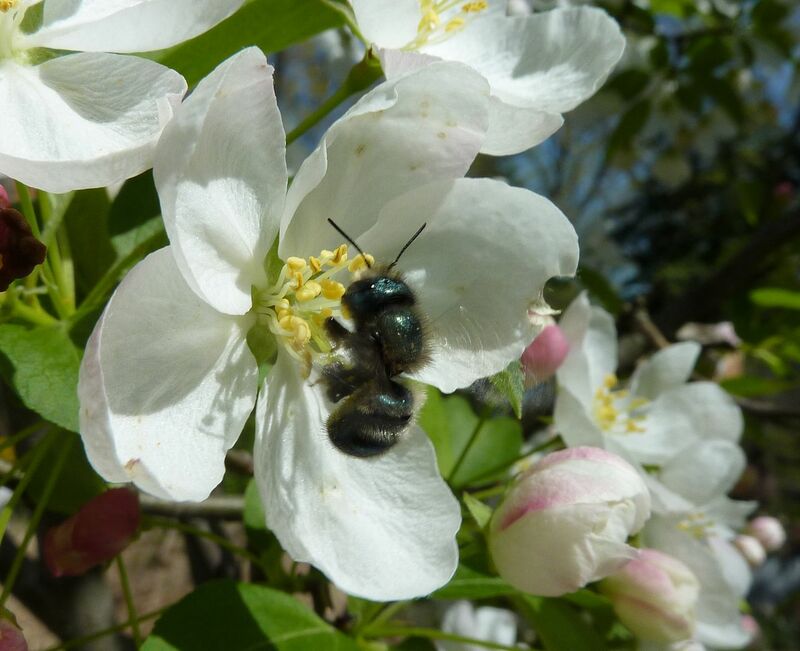 So early on, I find lots of native/solitary bees on my apple and other fruit trees because they're barely taller than I am. 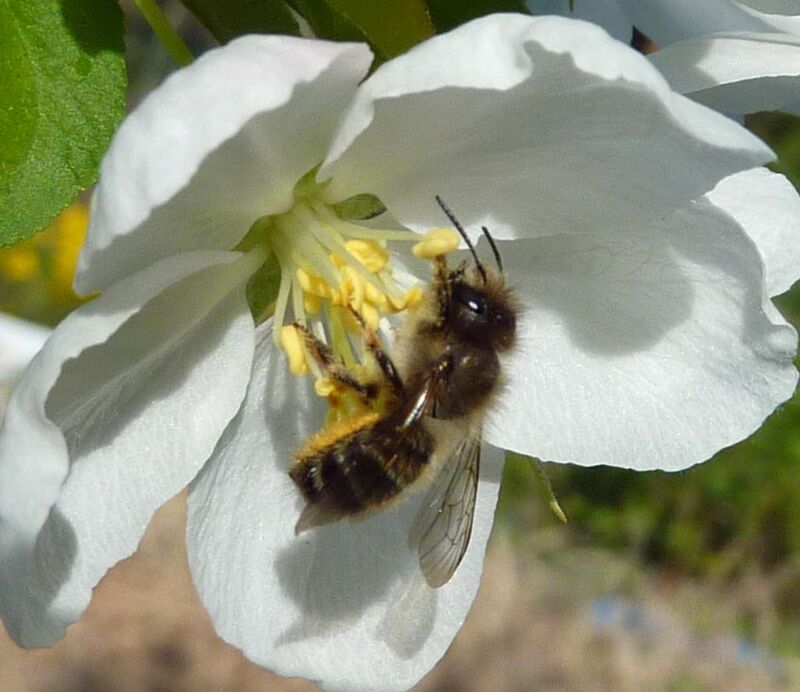 If I had an orchard of maybe 6+ trees of one species all flowering at once, and in close proximity of each other, they'd stand a better chance of getting honeybees. Not that it's horribly important to do this, as long as my honeybees are working something does it really matter? The fact that Blue Orchard Masonbees, Osmia cf. lignaria, and a diversity of other bees are visiting my trees isn't a bad thing either. As far as nectar goes, honeybees seem to only be an issue when they visit plants that they: 1) Don't pollinate, and 2) Actively steal the nectar and pollen in cases where there are bees that Do pollinate them. When this is the case then yes they are stealing from native bees and populations suffer. I strain to think of particular examples but I know they're out there. 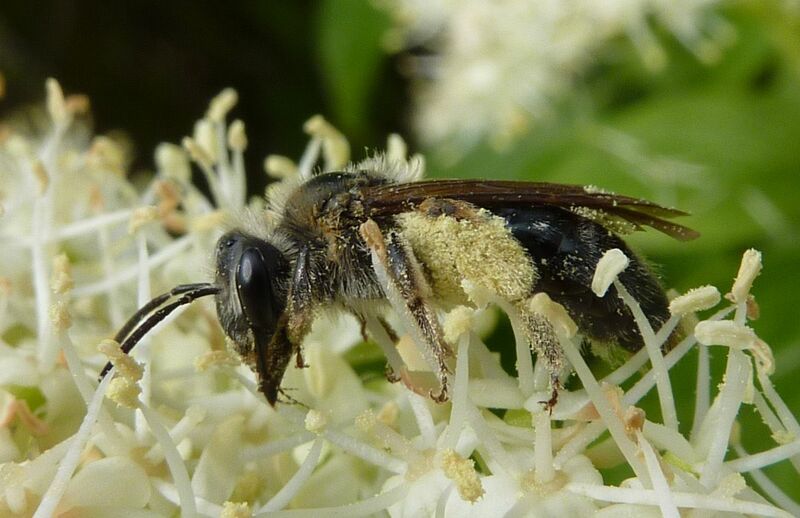 More commonly I hear examples of native bees being "Better" pollinators of certain plants. The Sunflower Bee, Squash Bee, and Rose Mallow Bee can be found on a variety of flowers but all specialize on feeding pollen to their brood of which the plants they are named after. Well Duh! I'd hope such bees that specialize in one type of pollen would at least pollinate the plant. Most of the time when this argument is used, it's usually about food crops so maybe scientists have a point. Alfalfa Bees are better pollinators than Honeybees but farms overall aren't designed with native bee populations in mind. Honeybee hives help to pollinate the middle of the fields where natives don't fly to as much. This image demonstrates the plant loyalty I was talking about. See how each pollen ball is pretty much one color. 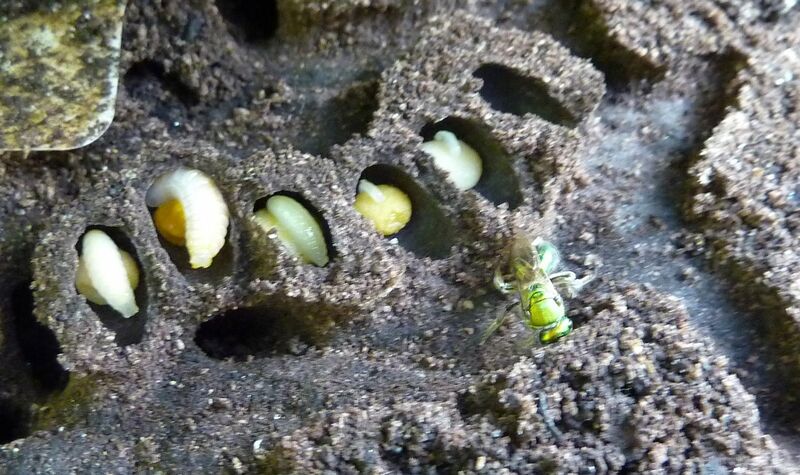 The sweat bee here deposits an egg on each one to consume it all. Which makes me wonder what the nutritional value of each plant's pollen is comparatively, and maybe this is why some bees have decided to specialize in giving only one type to their young. The honey produced by many plants varies considerably. With honeybees plants like Sneezeweed, Helenium autumnale, produce copious amounts of pollen, however the honey produced by this plant is described as tasting so f***ing awful that it tents to ruin all other types of honey its mixed with. As mason and carpenter bees get themselves situated for the year their natural parasites begin to emerge. Though to be fair I haven't ID'd this one (partaking of New Jersey Tea) and it may very well use beetle grubs as a host. Parasites like these are signs of a healthy ecosystem, at least for whatever species they use as hosts. If I remember right this was a Male Bumblebee I found in early July. Many bumblebee hives actually complete their life cycle early in the year. I know one species is done by June, and calling it "social" is almost a joke when we consider others last well into August. Bumblebee on Ox Eye sunflower. This isn't a true sunflower and the main difference is the petals can develop into seeds where as true sunflowers can not. You can't see it in this photo but there are tiny pollen anthers at the base of each petal. 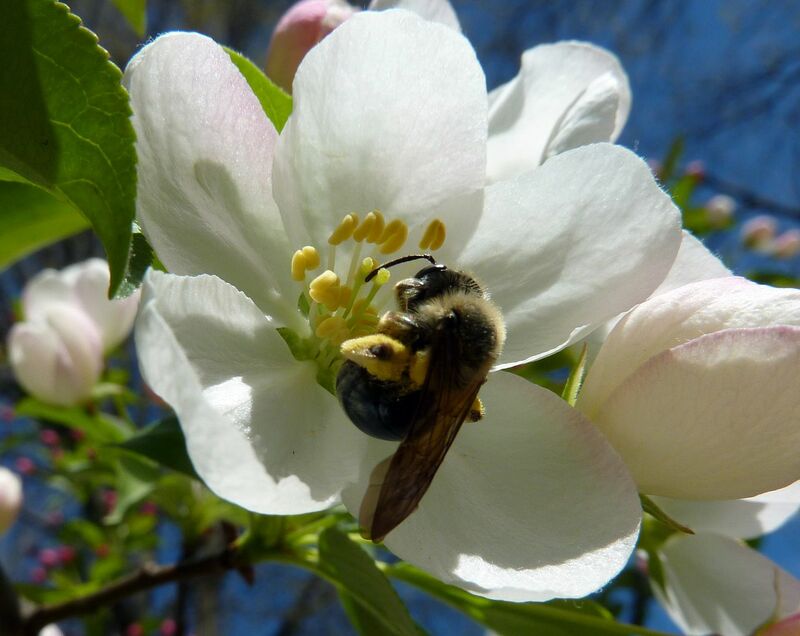 As summer rolls in, big flowering trees become rare and we see more honeybees on low growing shrubs and full sun perennials that bloom at this time. My bees found the buttonbush hard to let go of. They worked the flower balls well after the petals turned rotted looking. Part of this plants allure is that the honeybee tongue is 6mm long where as the florets on each ball are 9mm deep. This means honeybees rarely get all the nectar and likely why we see them working the flowers after they're past their prime. 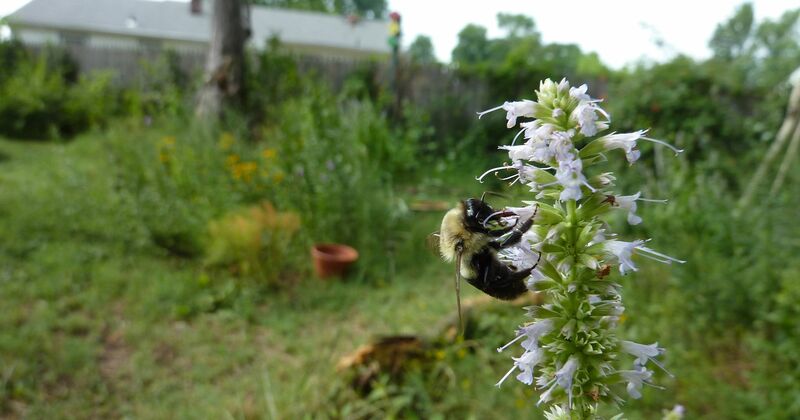 Liatris wasn't quite as popular as Mountain Mint and Anise Hyssop, but it got a hell of a lot more attention than the Black Eyed Susans did. 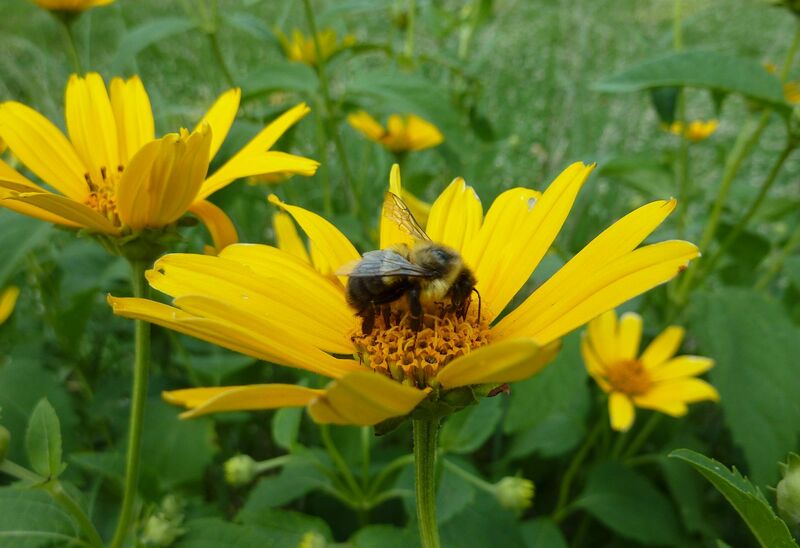 Rudbeckia in general is a genus of easy to grow forbs but most of them seem to only produce pollen or so little nectar that I rarely see bees working them. They're a nice filler plant for a great pop of yellow over the summer but otherwise go for Coreopsis, or better yet Coneflowers, or better still, Milkweed. Liatris make for a much needed splash of pink and purple in the prairie garden. And many species are popular with butterflies as well as native bees. 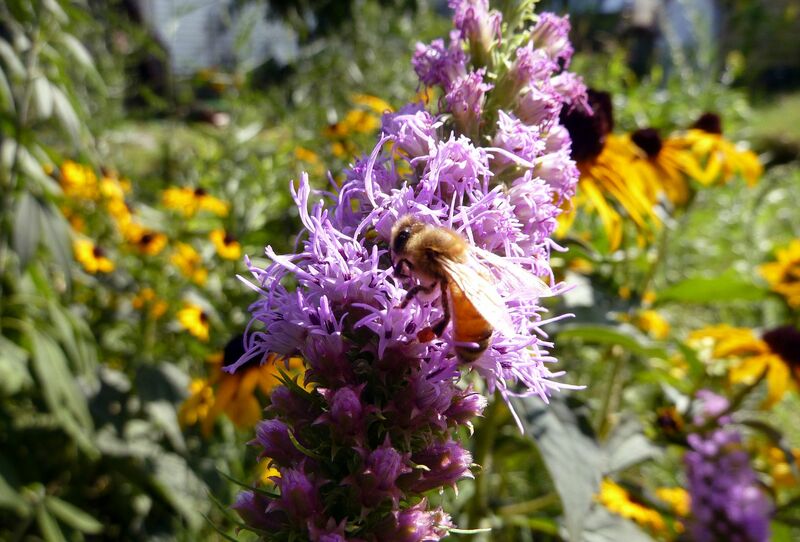 Anise Hyssop is so loved by bees. I recommend it over the Butterfly Bush which blooms for about the same amount of time. Mountain Mint is an improvement still that flowers about a month sooner and continues to do so well into frost. It does spread by root suckers but these are easily plucked from undesired areas. 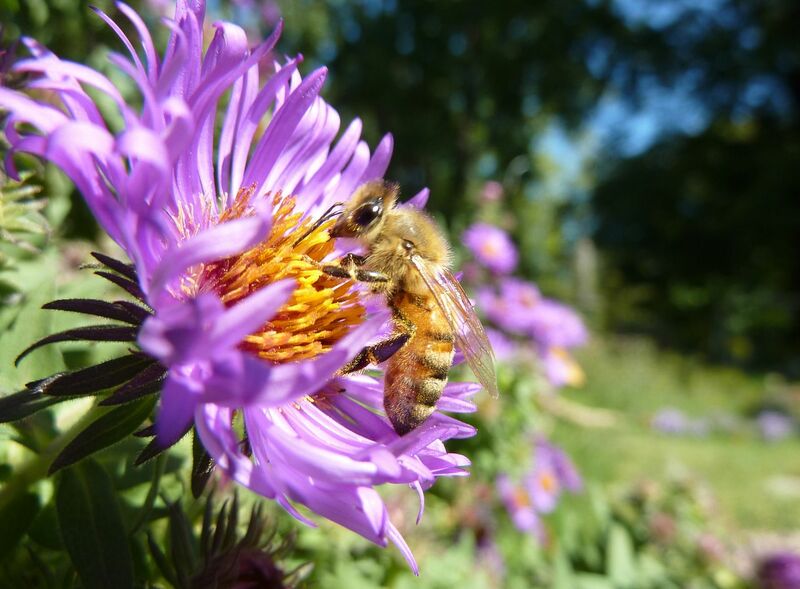 Asters are a late season delight though most species have to be planted in bulk to get honeybee attention. Usually this isn't a problem as Asters are diverse enough that there's usually one species growing as prolific as a weed somewhere. And if not them then Goldenrods are doing it for sure. 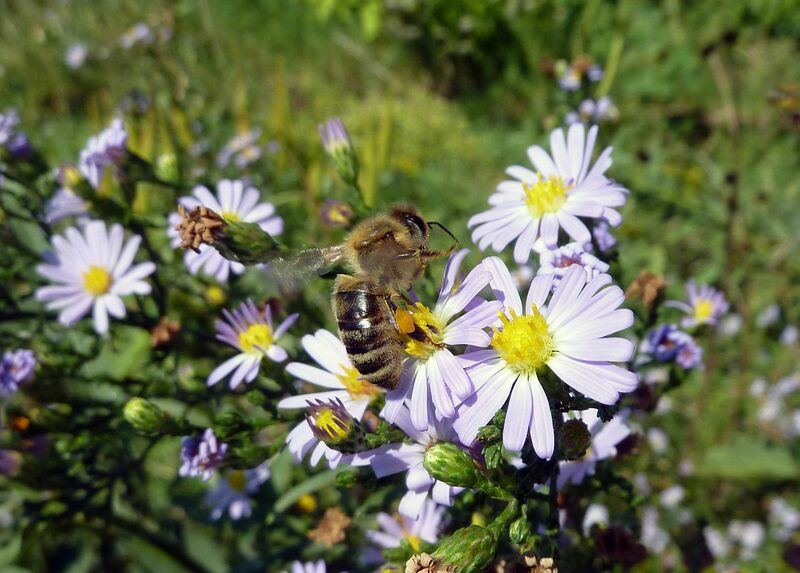 We end with a honey bee on a New England Aster, Symphyotrichum novae-angliae. Of the 8 Aster genera found in North America (The Alpine Aster is still in the true Aster genus as I learned,) Symphyotrichum is probably the most prized by honeybees. New England Asters in particular seem to take the fewest number of plants to attract copious numbers of them too. Another fun fact, this is the image I decided to use for the cover of my book. Nice Bee post. 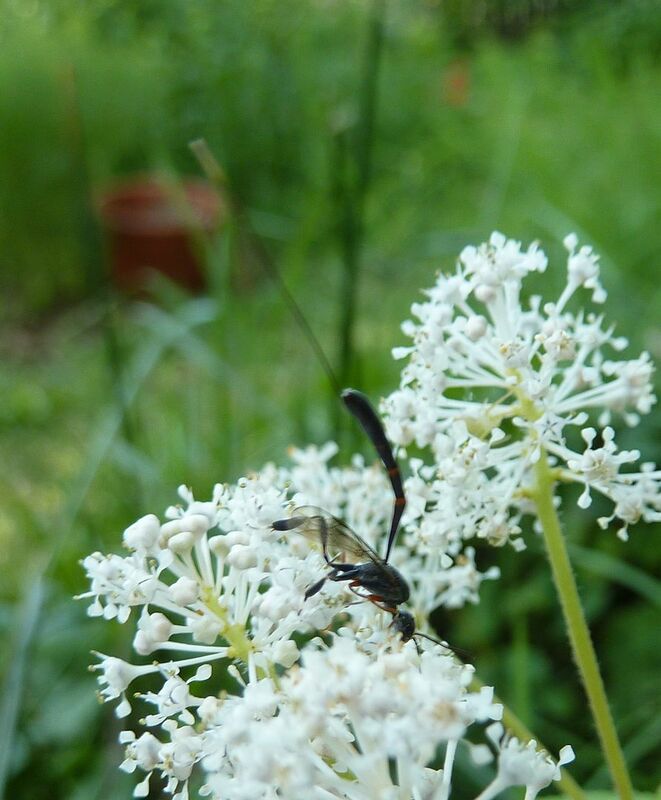 Looks like a Gasteruption Wasp on the New Jersey tea, I see them a lot on white flowering natives in early spring. When should we expect your book? Looking forward to it. Thanks for the ID. The book will be done when its done being edited. I don't trust myself to do that or to catch everything. I didn't even realize how often I throw the word "though" in for no reason until last week.